OK, I'm 14 right now but I’m almost 15. I have never had any training, but I’ve wanted to become a professional ballet dancer since I was about 4 years old. I know that every site I’ve looked at has said I’m too old to be a professional, but I still want to try. My mom finally got a job and is trying to catch up on bills and everything. We don’t have a lot of money but we do have extra money sometimes just not a lot. It's just my Mom, Brother, and I. She said that in a few months (which is probably 3-5 months) I could start taking classes and I’ve found a good school called America's Ballet School in Tampa FL. By the time I could take the classes I’ll be 15 and I know you might say that I’m too old to have a career in dance, and if you say that I’m too old I will still try (not meaning to sound or be disrespectful). But my question is what should I do right now before I take classes, if anything? I already stretch every day at least 3 times a day. Should I be stretching more or doing anything else besides sit-ups and push-ups? Thank you for taking time to answer this :). scholarships and bursaries I managed to receive for my dance training I managed to pursue a professional ballet career. I know that ballet can be very costly with the classes, ballet shoes and extra supplies. If you can look into any scholarships the America's Ballet School might have, then it is definitely worth a try. Before you take your classes, you definitely have the right idea by wanting to be prepared and stretching. I also suggest pilates or yoga which also stretches the muscles and strengthens your body, which is perfect for ballet. In fact, when ballet dancers are unable to dance due to injury or holiday, many of them turn to pilates to keep their body in shape. 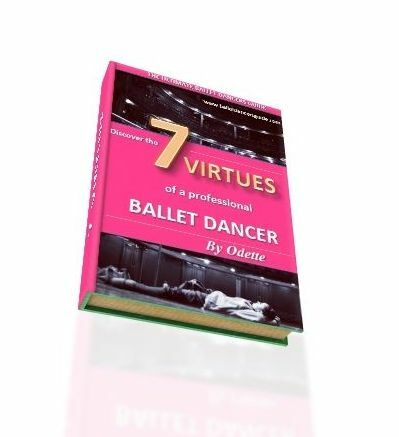 You can look at my ballet video page to get more ideas on the exercises. If you can, swimming is also a great favourite by ballet dancers to keep up the aerobic fitness and tone their muscles. I don't know if this will be convenient for you, but it is just a suggestion to think about. You can also mentally prepare yourself and get inspired by watching lots of ballet videos on youtube. It is free, enjoyable and fun but also really beneficial as you can learn a lot by watching. Take a look at the great ballerinas Tamara Rojo or Polina Semionova, or watch a section of Swan Lake to see what you are aspiring towards. Keep in touch and keep reading all the advice through my website, then you will be perfectly prepared!